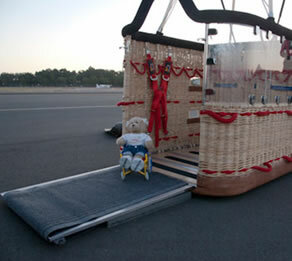 When you think of wheelchair accessible activities, hot air ballooning may not be the first thing to spring to mind. However, this could all be set to change in the future thanks to the innovation of a foundation based in San Diego, California. Guided by their founder Mr Pat Murphy, the ‘Reach for the Stars Foundation’ developed a custom made, wheelchair-accessible basket which was designed, built and approved for flight under strict Federal Aviation Administration (FAA) guidelines. The basket is large enough to accommodate one passenger in a wheelchair as well as two standing passengers and the unique design incorporates a fold down side to the basket which can be used as a ramp to allow easy access for wheelchairs. In addition to this there is a clear partition on another side of the basket which enables someone seated in a wheelchair to share the stunning views. We would like to thank the Society of American Travel Writers (SATW) for making us aware of this incredible foundation. They operate a programme called ‘Travelling Teddies’, the purpose of which is to encourage children to take an interest in geography and different cultures around the world. If you have someone who is confined to a wheelchair and would like to fly in a hot air balloon in the UK we suggest you contact Aerosaurus Balloons direct, who will be pleased to discuss your requirements. Although we do not currently operate a ‘wheelchair friendly’ basket, we will discuss your requirements and do all we can to accommodate you where possible. If we cannot take you in one of our balloons, we can recommend another company who may be able to in another part of the UK. The latest addition to the programme is a bear called Cherrie who has limited mobility and she is set to travel around the world taking part in activities previously thought to be impractical for people suffering from limited mobility. The Reach for the Stars Foundation is a non-profit organisation whose vision is to give people with limited mobility the chance to experience the magic of hot air ballooning. Although there are only a few examples of these balloons operating in the United States of America, we hope this is a glimpse of things to come in the future.